if you’re looking for top quality wire mesh lockers, look no further because you have come to the right place! At CS Storage, we provide an exquisite range of mesh lockers which are ideal for storing almost anything and offer employees and employers the benefit of high visual security as well as easy cleaning. All of our wire mesh lockers are fitted with 150mm legs as standard so you will have easy access all the time. On top of this, the multiple compartments can provide the perfect solution to store smaller items. When it comes to supplying high quality wire mesh lockers, CS Storage should be your number one choice! We are one of the leading experts in work storage units, lockers and industrial cabinets for lots of industries. You can come to us if you need top quality storage solutions for your work premises. Why choose wire mesh lockers? We specialise in a wide selection of work lockers and storage solutions for you to choose from. 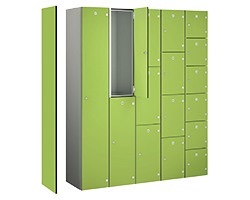 Our mesh lockers are a popular choice for businesses because they are versatile and safe. Our wire mesh lockers can’t be beaten on price! No matter what industry or sector your business works in, we are sure to find you the perfect storage and work locker solution. We believe in offering top of the range products for at low prices. We guarantee the best value for money every time. If you find a like for like locker at a cheaper price, we promise to beat it! Our wire mesh lockers are extremely versatile and practical. Manufactured from 25mm x 25mm x 2.5mm weld mesh on an 8mm rod frame (1980mm high x 305mm wide x 305mm or 450mm deep), and offer you high visual security and superb ventilation. If you would like to purchase our wire mesh lockers or have any questions about our other products, contact us on 01772 322634 and one of our friendly team members will be more than happy to assist you.